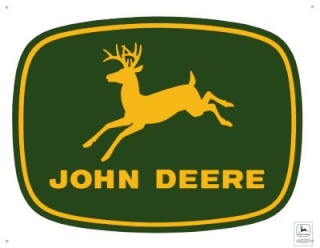 I recently purchased a John Deere 1010, serial number W20666. It looks a little rough, but runs great and has a JD 710 FEL and rear PTO. Here's the problem, a steering cylinder end has wore out. Unfortunately, I'm finding out the hard way that I purchased a relatively rare tractor. Parts are very hard to come by and when they are to be had, very expensive. Anyway, it has the non adjustable front end (swept back?) and the part I need (AT15705T) is no longer made or stocked. It has 1/2" x 20 thread on the stud and 11/16 x 18 female thread where it screws on the cylinder. Any suggestions or someplace you can point me? My only option is cutting the female end off the worn out piece and welding it on to a random tie rod end with a stud long enough to do the job. I'm heading to NAPA in the morning to dig through thier tie rods and see what we can come up with. I won't promise anything but I'll check at work tomorrow to see if there are any cross references or substituted part #s.
I'll have to get the parts guys to run it since I don't really play in that end of the sandbox. Thank you so much! In the mean time, some creative welding and I'm back in business. I haven't had it a week, but I'd really love to find a way to quiet it down. It has the black JD muffler it is supposed to have, but man, is it loud. Any ideas on that, or am I wearing ear protection every time I run it? I would check of leaks around the exhaust manifold I had to have an extra gasket added to help with a leak, also even with a muffler the 1010’s are a little on the loud side LOL personally I never seen a quite 1010. I've definitely got some manifold leaks and the start of a crack. A new manifold is on my Christmas list, along with about $500 worth of other goodies for my new toy. We haven't found that Part# in any of our searches. We are also having a hard time trying to figure out exactly which part you are describing. Can you give more details about location, what it is connected to, what it actually does (or appears to do). Also, if you could give the whole serial number it might help. The number you gave, W20666, doesn't fit the pattern. Are you sure you have the tractor serial number and not an engine number or some other part number? The serial number plate should be on the right side of the engine. Edit - Just a few minutes after I posted this I got transferred to another store on an indefinate emergency basis (another employee sick) so it may take a little longer for me to research any information. I'm now at our main store so it is much more busy than my other location...and it is harvest. I'll do my best to help out in a timely fashion. The Serial Number example didn't format like I typed it. There should be space between the Model, Chassis, SN and the second line space between 1010, RU, and xxxxxx. I've got a diagram that Deere sent me, but it's a pdf and it won't let me post it here. Anyway, it's pretty much a tie rod end that fits on the end of the steering cylinders. Pretty sure it's exclusive to W series tractors. I don't think the other version machines have these steering cylinders. Also, my serial number goes something like this... 1010 W 20666. Ahhhh. I understand the serial number better. It's an industrial. Hmmmm. That also explains why we couldn't find it in our parts manuals. We were looking at the AG parts manuals. I don't know if we can (easily) get the C&F manuals or not. I'll check. By steering cylinders do you mean the horizontal sections of "pipe" between the tie rod end and the arm (the piece that both "cylinders" attach to at the at the base of the steering gear)? The "cylinders" run across right behind the axles? They are about an 1 1/4" in diameter (give or take, I'm guessing here). You may have already found this but here's a short page about industrial 1010s. I took "Indy" (I name all my vehicles) out to the woods behind my house yesterday to cut a little wood. The temperature here in Central Ohio was 45* and it took FOREVER to get warmed up. It "sputtered" on the top end pretty much the entire time. I've ordered a tune up kit off of ebay... points, distributer cap, roter, plugs, etc. Will that help or is a carb rebuild in my future? Still new to this, but I really want to keep this machine and treat it right. I haven't forgotten you or the steering cylinder we just haven't found anything. We've been slammed at work and there just hasn't been anytime to really dig. Unfortunately it doesn't look good on the surface. There just were not enough of them made, or survived, to have any market for specific parts. Your best bet is probably to start hitting up salvage yards and such if you are wanting a replacement. Otherwise the backyard fix seems to be working for you. As far as the carb rebuild goes I'd suggest going ahead an doing it. I bought a carb rebuild kit and rebuilt my son's carb easily in an afternoon. I don't know that it was particularly needed it but it was cheap and easy enough to do so it couldn't hurt. He now knows that it is good to go and shouldn't give him any trouble for a while. My 1010 Industrial uses the same steering cylinders. While you're in the book there is a leaking cylinder on mine I'd like to find a rebuild kit for.